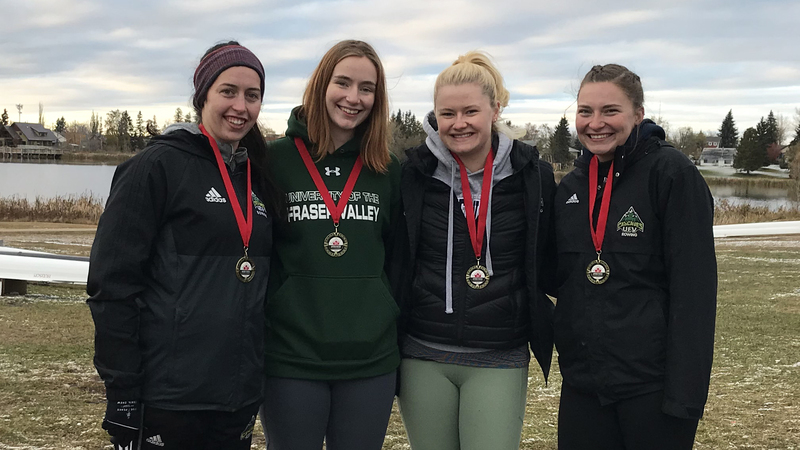 Michelle Olive, Shivohn Peters, Serene Blanchard and Julia Siemens joined forces to win gold at the Western Canadian University Rowing Championships. The University of the Fraser Valley rowing club braved wintery conditions to turn in some impressive results at the Western Canadian University Rowing Championships in Leduc, Alta. on the weekend. The event was hosted at Lake Telford by the Calgary Dinos, and featured entries from UVic, UBC, Alberta, Regina, Manitoba, and Lakeland College along with the Cascades. On race day, there was snow on the ground and wind chill at -8 C. Though the weather wasn’t exactly what the Cascades were used to, the women’s four crew provided a major highlight, winning gold in the varsity women’s second division. Julia Siemens, Shivohn Peters, Serene Blanchard and Michelle Olive clocked a time of 8:44.4 to finish six boat-lengths ahead of competitors from Calgary and Regina. In other action, Olive and Peters teamed up to win the women’s pair B final, beating out fellow Cascades Blanchard and Siemens, and a boat from Regina. Genelle Grubb and Emily Klootwyk finished fifth in the lightweight women’s double A final, edging the Calgary Dinos by one second. The previous weekend, the Cascades participated in a club event at Burnaby Lake with UBC and SFU; Andrew Stahl’s victory in the men’s single sprint race was the highlight. Up next for the UFV rowing club is the Canadian University Rowing Championships, hosted by Brock University on the Henley Island Rowing Course in St. Catherine’s, Ont., Nov. 3-4.